CHANGES IN TRANSPORT PLANNING POLICY: CHANGES IN TRANSPORT PLANNING METHODOLOGY? The 1990s saw the emergence of influential of transport legislation both in the UK and in the USA. changes to commonly used methods. Criticisms of urban transport planning are traced in the paper. approaches are needed in order to address the new types of problems which transport planners face. the implications of a changing policy environment to the training of transport planners in the future. CHANGES IN TRANSPORT PLANNING METHODOLOGY? appear to be indications that a significant turning point in transport policy is underway. 2. Consistency of treatment between modes is important. 3. It is acknowledged that meeting all desires for transport is an impossibility. 5. Some classes of traffic are necessary or desirable, and there is a call to prioritise these. finally some thoughts on the new directions required for transport planners. usually a civil engineer) as expert (Healey, 1977). other whole bodies – which contrasted with the reductionism integral to the scientific method. techniques, the environment and the resources. systems thinking, which is the central theme of the latter part of this paper. planning; and computing tools to implement all of these. transport planning and goes on to describe an alternative to the rational methods. but which has not been fundamentally rethought from the ground up” (Wachs, 1996). The rational comprehensive mental model requires reconsideration for several reasons. planning process. The rational comprehensive mental model does not easily allow for this. are ‘rarely found in democracies’ (Szyliowicz and Goetz, 1995)). making, and that transport planning is as much a political exercise as it is a technical one. failed, and conclude that the political dimension is repeatedly ignored or under-estimated. modelling tools alone will not be the solution to improving urban transportation systems. as Peter Senge (see ‘The Fifth Discipline’, 1990) and De Bono (1986). problems which fall outside the prescriptions of the hard systems method. commonly found in transport planning institutions and programmes. faced with presenting schemes, which have both positive and negative impacts, to the public. transport systems as they are usually described (by numbers of vehicles, speeds, accidents). transport planning. The SSM approach is frequently described as a series of logical steps. (a) Who is/are the Customer/s of the (transport planning) process? (b) Who is/are the Actor/s involved (in the transport planning process) ? those involved in the (transport planning) process? (transport planning) activity is occurring? (a) Does the logical activity exist in the real situation? (b) How is the real activity done? (c) How is the real activity judged? practitioner/s, using different worldviews, and hence different logical conceptual models. analysis and the cultural analysis described below. the practitioner and of what values should be used to assess performance of the system. to the surface conflicting values. concerned with making explicit values, which are normally not discussed. preserved or protected? How are they passed on? And finally, how are they relinquished? national governments had historically provided most of the funding for their implementation. planning applications, rather than in providing input to the local decision-making process. (f) meeting transport needs, with the general public as customers, were examined. logical and cultural analysis procedure. “A system for decision making which serves all those on the committee, and also lobbyists. 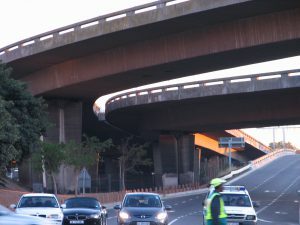 transport planning processes in Cape Town. process of the debate and the background information on which decisions are taken. EFFICACY: The system produces decisions, but are they in the correct areas? than on solving Cape Town’s problems. hold a more stable position of power, and are unlikely to lose it, unless they lose their jobs. and hence part of their power. part of the process must be a valuable tool. of, or between, all the relevant actors. model of problem solving has led to serious problems. complex social and political nature of transport planning. two anonymous reviewers and Rob Kane. Engineering and Control, September 1996, 460-467. Checkland, P. (1999) Systems Thinking, Systems Practice. Includes a 30-year restrospective. Supported by the Rees Jeffreys Road Fund. Landor Publishing, London. De Bono, E. (1986) Six Thinking Hats. Little Brown and Company, London. Department of Environment, Transport, Local Government and the Regions (2000). Theory and Application of Systems Science. Second Edition. Plenum Press, New York. Practice. Plenum Press, New York. Travel Forecasting. Sage Publications, California. Theory: The case of Denver International Airport. Transportation Research 31A, 263-280. Goodwin, P., Hallett, S., Kenny, F. and Stokes, G. (1991) Transport: The New Realism. Report to the Rees Jeffreys Road Fund. Transport Studies Unit, University of Oxford. Transport Policy. University College, London, 23rd October 1997. Transport Strategies. Stephen Austin, Hertford. a city, lessons for a city. Unpublished M.Sc. Thesis, University of Cape Town. Cape Town. pp 422-431. American Society of Civil Engineers, Denver. American Planning Association 60, 3-5.
de Neufville, R. and Stafford, J.H. (1971) Systems Analysis for Engineers and Managers. in transport policy. Transport Policy 2, 43-49. Dynamic and Activity-based Approaches”, Lady Margaret Hall, Oxford, UK. Transportation, pp 53-77. The Guilford Press, New York. Wachs, M. (1985) Planning, Organizations and Decision-making: A Research Agenda. Wachs, M. (1996) A new generation of travel demand models. Guest editorial. Australia, Journal of Applied Systems Analysis, 15, 3-26. Weiner, E. (1997) Urban transportation planning in the United States: A historical overview. in academia in South Africa. Department of Civil Engineering at the University of Pretoria.